This is one of my favorite and, as it turns out, one of the rarest pieces I have in my collection. 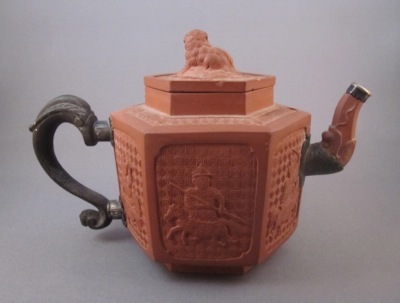 I purchased it last fall at auction where it was among a small but impressive collection of early Yixing teapots, most with silver mounts. In total, over a dozen items were being offered; at least half were museum quality. I ended up with 2 teapots, each with multiple replacements, and I paid dearly for them. I only wish I had been able to forgo my monthly mortgage payment and purchase the entire lot so I could keep the assembled collection intact. 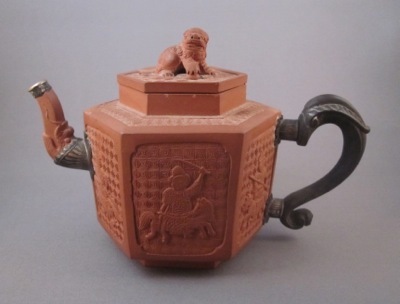 But at least I acquired this breathtaking teapot, which in my opinion is the best of the lot, along with another rare gem, which I will post at a later date. 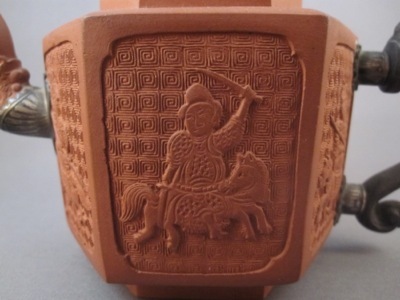 Made in China during the Kangxi period (1662-1722), this Yixing teapot of hexagonal form is decorated with six relief molded panel designs on a thunder pattern ground and depicts spear and sword carrying warriors on horseback. 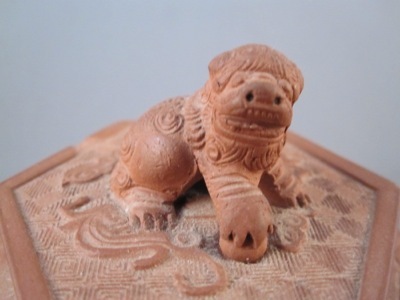 The matching lid with a beautifully carved Buddhist lion finial has a thunder pattern ground. 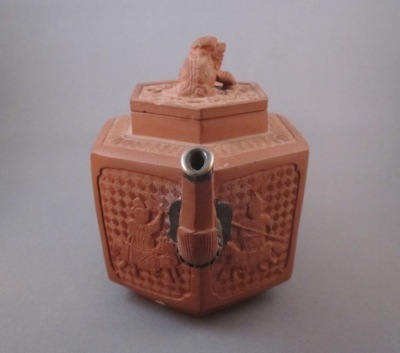 The teapot stands 4.5 inches high. The intricate details make this piece special, but the exquisite silver mounts and carved wood handle make this piece magnificent. 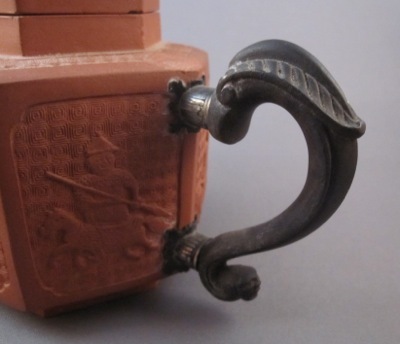 When the original handle and spout broke off sometime in the first part of the 18th century, a silversmith of the highest level created these outstanding repairs and replacements. 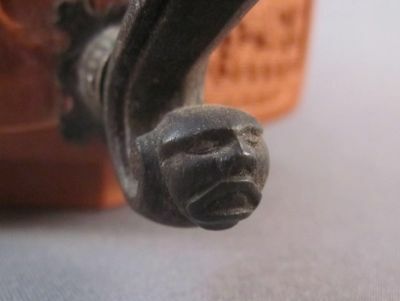 The wood handle is carved with what appears to be a scrolled leaf on top and a tiny grotesque head at the bottom, attached to the body using chased silver mounts. 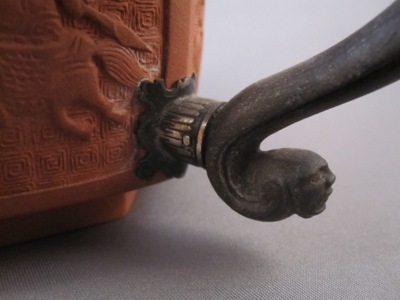 The spout is repaired with silver mounts at the base and at the tip, both handsomely engraved. 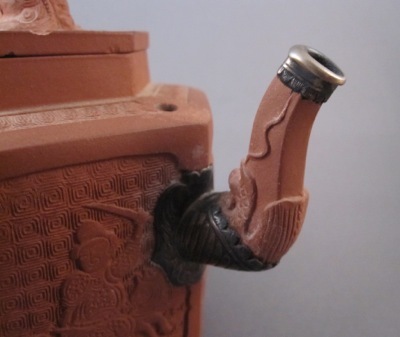 There is a small hole at the top of the body near the spout, which I have seen on other Yixing teapots. 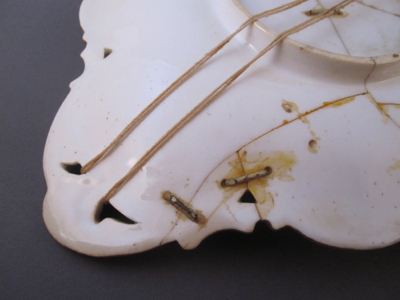 Some of these other examples have a small silver mount covering the hole. Does anyone know if this is to allow steam to escape or why on some pieces the hole is covered? 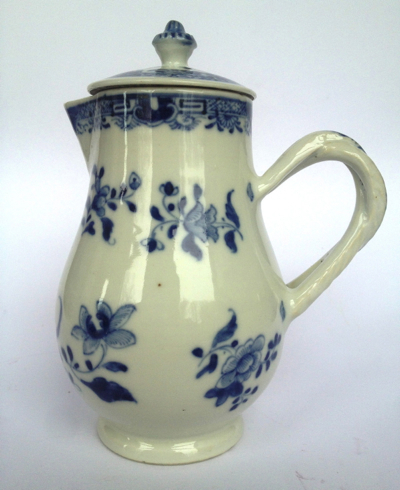 This teapot with similar form shows what the original loop handle would have looked like on my teapot. 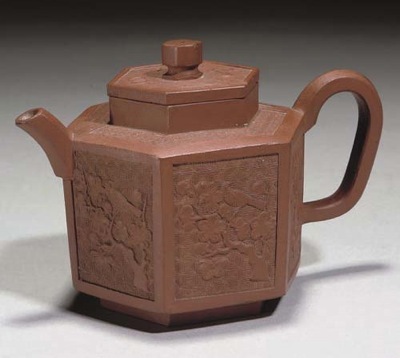 For more information, please take a look at other Yixing teapots I have previously posted to see a variety of forms and styles and to learn more about Yixing clay and its unique qualities. 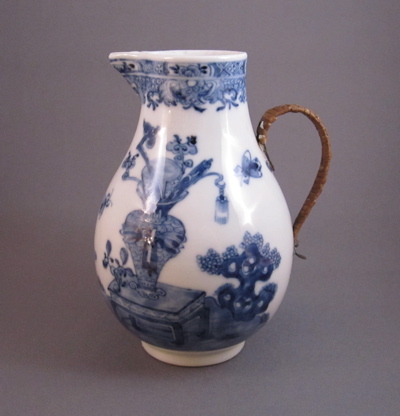 Chinese porcelain baluster-form hot milk jug with sparrow beak spout, made in the mid to late 18th century during the Qianlong Period (1736-1795). 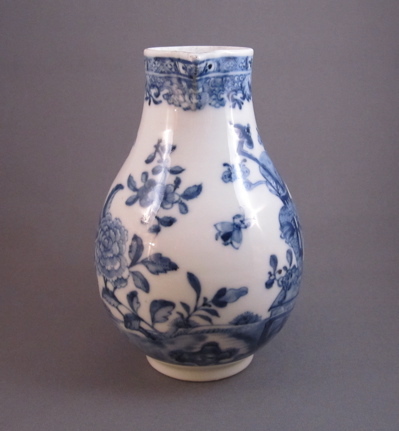 Delicately decorated in underglaze cobalt blue, it shows a large vase sitting on a carved wood table and filled with precious objects surrounded by flowers and a pair of bees. The scale of these objects is a bit off-kilter, which adds a whimsical quality. 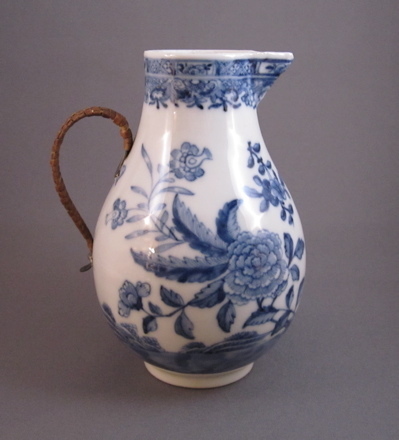 Jug measures 5-3/4″ high and 4″ wide to the end of handle. 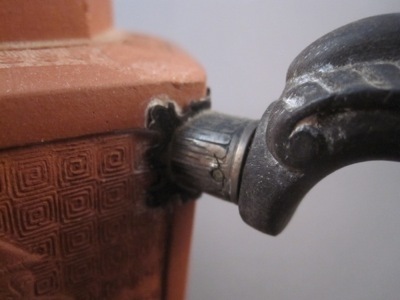 The original porcelain handle was replaced over one hundred years ago with a woven wicker-covered bronze replacement. 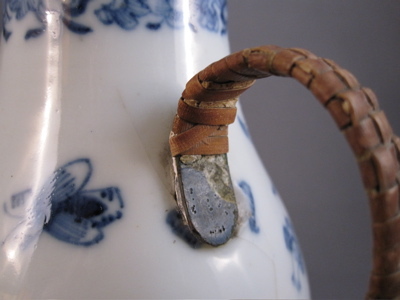 I have dozens of examples of wicker-covered metal replacement handles in my collection, as this was a standard form of inventive repair; and at first glance, the handles all look pretty much the same, but upon closer inspection, you will see a variation in the pattern of the weaving. This handle has a straightforward checkerboard weave, while some of my pieces have the rattan in more than one color and woven in a more intricate pattern. 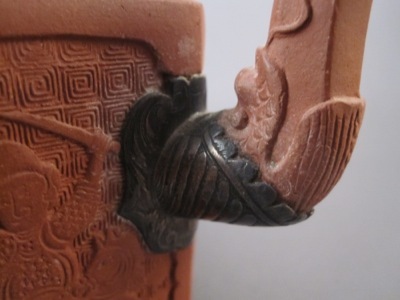 I think a post dedicated to showing the many variations of woven-handle styles would be interesting, don’t you? 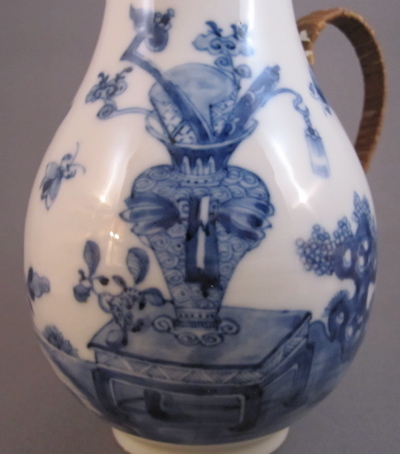 This blue & white decorated jug with similar form still has its porcelain handle and lid intact. 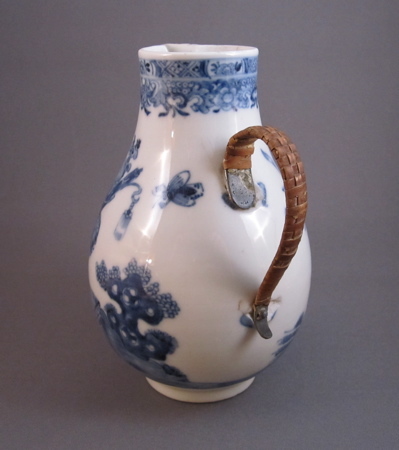 Before my jug became an example of “inventive repair” it would have looked much like this one. In honor of Mother’s Day, I am featuring a dish that only a mother could love. 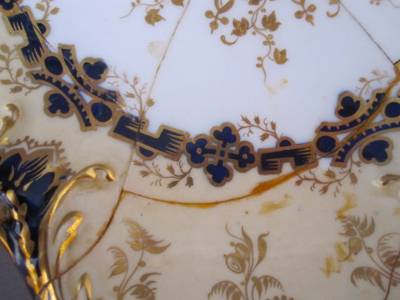 I believe it to be English from the mid 1800s and made of porcelain with hand painted decoration in cobalt, drab and gold. It is marked on the bottom with the numbers 4 over 554 and measures 9″ x 10″. 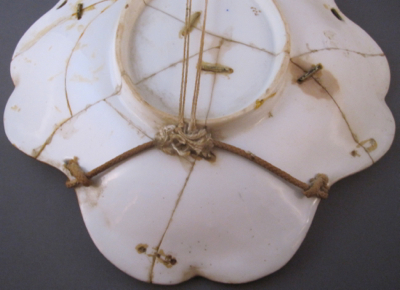 This is truly one of the saddest antiques with inventive repairs I have ever seen, and believe me, it took much inner soul searching just to purchase it. 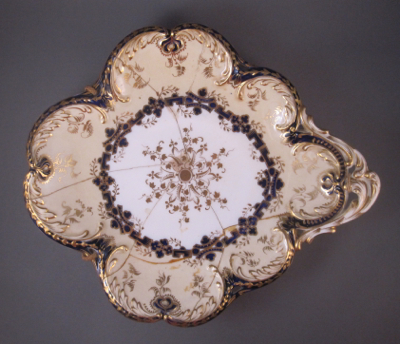 I am breaking with tradition and showing the underside of the plate first. Take a deep breath…this is not going to be pretty. 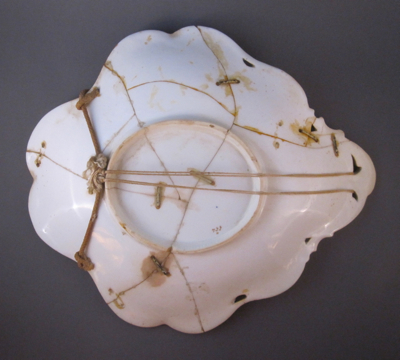 This dish must have held great sentimental value for its original owner. In order to make it “whole” again after being shattered over 100 years ago, it was professionally repaired using 10 large metal staples, overpainted to mask the unsightly raw material. 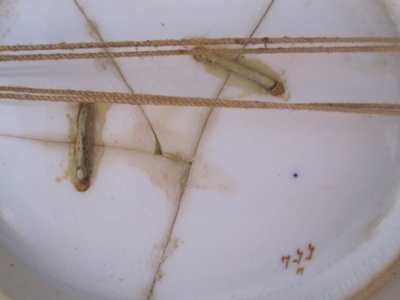 Sadly, the dish was dropped AGAIN, resulting in the loss of 3 staples and a sloppy glue job, now yellow with age. To add insult to injury, later in life it was bound with a cat’s cradle worth of string and cord, so it could proudly hang on a wall for all the world to see the tenacity of this unlikely survivor. 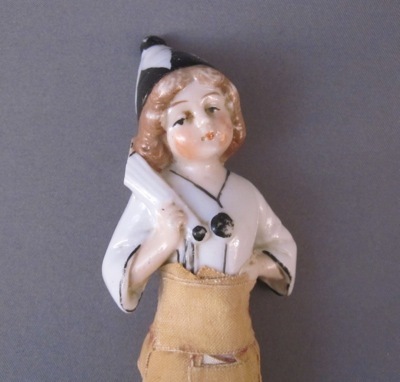 This unmarked porcelain novelty was most likely produced in Germany around 1920 and measures 5-3/4″ long. 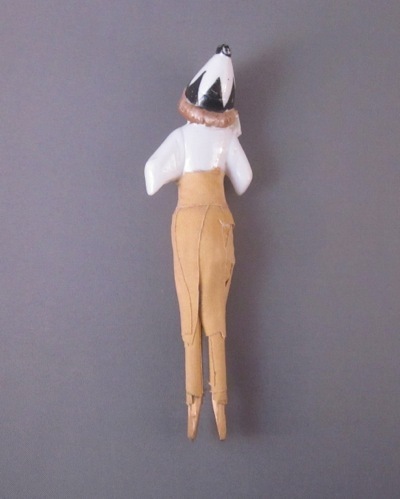 Also known as half dolls, they were typically attached to tops of pincushions, boxes and small clothes brushes and displayed on vanity and dresser tops. 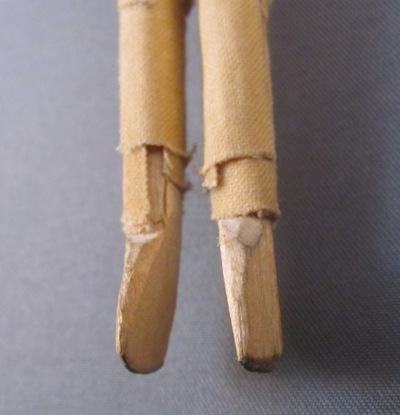 This one graduated from half doll to full doll, with the aid of a wooden clothespin attached at the waist. 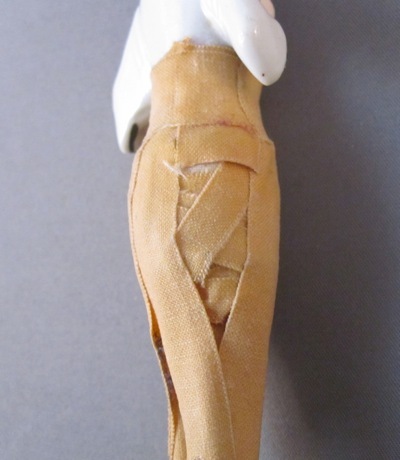 I imagine that after the piece broke, a handy dad whittled the lower extremities to form makeshift prosthetic legs. In an attempt to create a respectable outfit for this coquettish lass, the clothespin legs were covered in now faded pink cloth tape, the duct tape of its day. 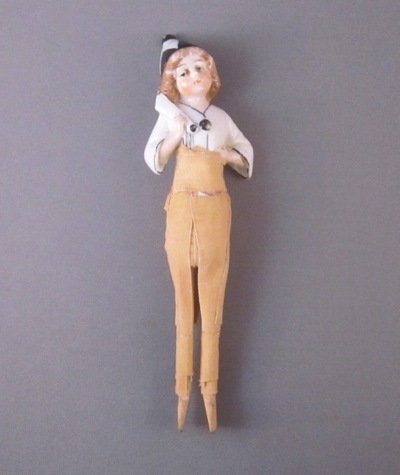 Wouldn’t it be great if this immobile doll ended up in a doll house, filled with inventively repaired miniature furnishings and inhabitants, including a make-do Pierrot? 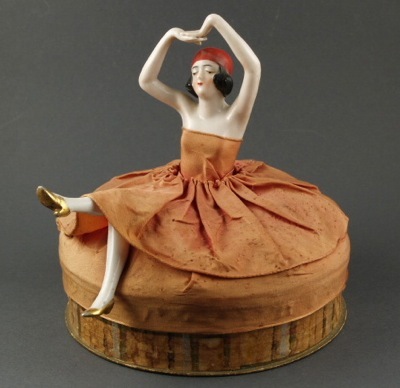 This lovely lady sits atop a powder box and still has her original porcelain legs.